The global mobile payment market was worth US$ 881 Billion in 2018. Mobile payment is defined as a transfer of funds done under financial regulations with the help of a mobile device. The first patent on the mobile payment technology was filed in 2000 and it has been growing ever since. A major factor that is influencing the market and making mobile payment popular among consumers is the assurance of safety that it provides in the transactions. With mobile PoS systems, the data of the customer’s credit card is not saved on the merchant’s PoS terminal. During the transaction a code is generated that can be sent over OTA (over the air) or manually by the consumer. These transactions can easily be made with a smartphone and an internet connection. Rising penetration of smart phones, increasing internet accessibility, convenience, safety, rising awareness levels, etc. are some of the key factors that are driving the global mobile payment market. Mobile payment makes it easier and more convenient for consumers to pay for products compared to credit card or cash payments. Payment from mobile phones is contactless without having customers to pull out their credit cards, cash, or write out a check. A major factor driving the mobile payment market is that they can be easily integrated with loyalty and incentive programs. The consumers are not required to keep cards or cash as all the necessary information gets stored in the app with every purchase they make. Valuable customer data can also be accessed through mobile payments, such as how often they shop, what they buy, and their preferred mode of payment. This information can be used by vendors to target their customers based on their shopping behavior, patterns, demands, etc. Mobile payments are extremely secure. Most mobile payment applications are tokenized, this means that they don't store or send a customer’s credit card information. When a customer enters his/her card information, the application verifies it with their bank and subsequently, uses a "token" as a stand-in for the customers personal information. Each transaction is made using that token integrated with a one-time-use security pin. Even if a hacker gets the card details of a customer, it will be extremely difficult for them to misuse their account without having an access to the customers mobile phone. Mobile payments provide security even in a case where the mobile phone is stolen as the payment information remains secured behind a passcode or biometric authentication (or both). 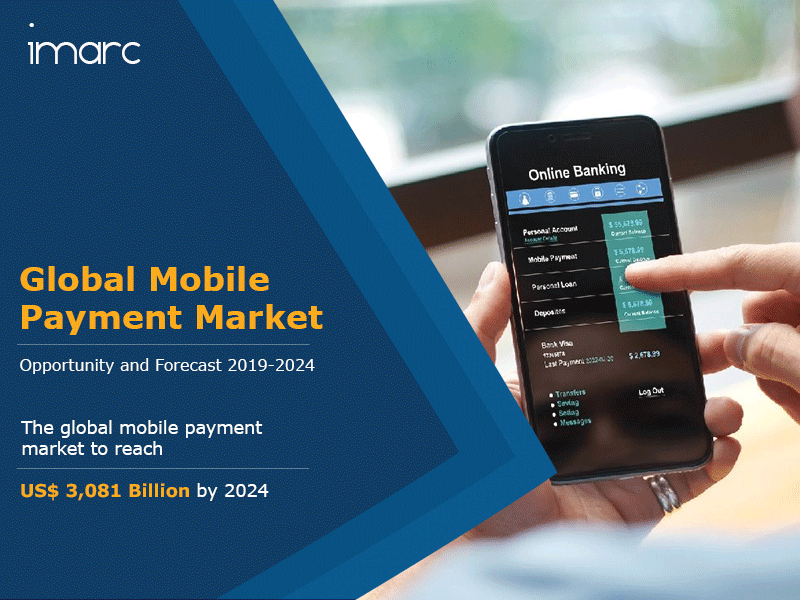 On the basis of the mode of transaction, the mobile payment market has been segmented as WAP (Wireless Application Protocol), NFC (Near field communications), SMS (Short Message Service), USSD (Unstructured Supplementary Service Data) and others. Based on the application, the market has been segmented into entertainment, food and beverage, energy and utilities, healthcare, retail, hospitality and transportation, and others. Region-wise, the market has been segmented into Asia Pacific, North America, Europe, Middle East and Africa, and Latin America. This report provides a deep insight into the global mobile payment market covering all its essential aspects. This ranges from macro overview of the market to micro details of the industry performance, recent trends, key market drivers and challenges, SWOT analysis, Porter’s five forces analysis, value chain analysis, etc. This report is a must-read for entrepreneurs, investors, researchers, consultants, business strategists, and all those who have any kind of stake or are planning to foray into the mobile payment market in any manner. How has the global mobile payment market performed so far and how will it perform in the coming years? What are the key regional markets in the global mobile payment industry? What is the breakup of the global mobile payment market on the basis of mode of transaction? What is the breakup of the global mobile payment market on the basis of application? What are the various stages in the value chain of the global mobile payment market? What are the key driving factors and challenges in the global mobile payment market? What is the structure of the global mobile payment market and who are the key players? What is the degree of competition in the global mobile payment market?